Conor and his mother live in a cozy house before a church with a graveyard and a yew tree. He's been having the same nightmare repeatedly: powerless, hands slipping from his grasp, a heaviness. When he wakes in the middle of the night to a strange voice calling his name, it is not the monster of his nightmare, but another walking in the form of the yew tree. The monster says Conor called him, but he has no recollection of doing any such thing. Conor will listen to three stories from the monster and then he will have to tell a story of his own. His truth. The one thing Conor is the most terrified to talk about because the truth and his nightmare are inseparable. At school, Conor is bullied everyday by Harry and his cronies, and no one seems to ever catch them because Harry's every teacher's pet. Still, when Conor's ex-friend Lily intervenes in Conor's daily beating, Conor is even angrier with her than before. None of the students and teachers at school see Conor as himself anymore; they only see him in terms of the hardship he's going through. He no longer answers questions or pays attention in class. There are entire days where the only people who talk to him are Harry and his cronies. When he's home, Conor takes care of himself and his mother. They've always been able to take care of each other on their own, but when the latest batch of chemotherapy doesn't help the way it normally does, Conor's mother has to check into the hospital. Conor is left with his grandmother who has a sitting room he can't sit in and never cooks a meal. His father's visiting from America, but Conor still has to stay with his Grandma. All the while the monster keeps visiting and the time for Conor to tell his truth quickly draws near. 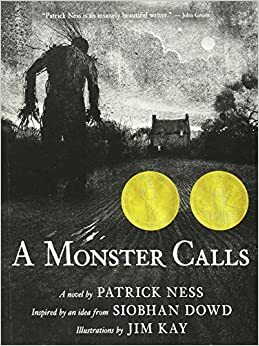 A Monster Calls is an aching tale of sickness and moving on, bullying and friendship, forgiveness, and never giving up hope.